Home » Blog » Company News » Our New Display Workshop! Amadeus are very excited to have acquired new premises near our office in Battle, to be used as a workshop and store. 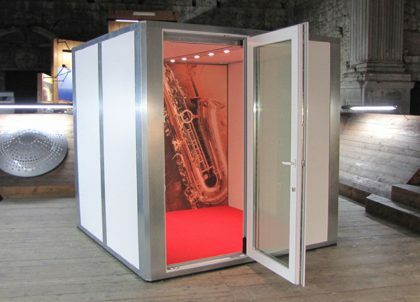 It’s a temporary solution to our current display and storage needs, to house various products we wish to make available on next day delivery and also to install a brand new M-Pod® that can be booked for testing – or even music practice and recording – by our clients. We’re currently in the process of installing racking to safely store acoustic doors and the like, and look forward to trialing different looks and extra features within the display M-Pod® … We’ll post more photos on Facebook as the workshop takes shape!